Dr. Mark Lebeda at Mid-Michigan, Ear, Nose, and Throat, P.C. 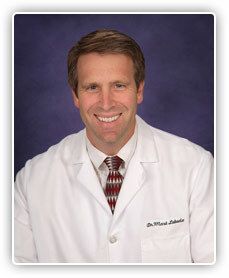 Dr. Lebeda graduated from Luther College in Decorah, Iowa in 1988 with a Bachelor of Arts Degree in Biology. He completed medical school at the University of Iowa in 1992 and went on to complete his residency in Otolaryngology/Head and Neck Surgery at the University of Rochester at Strong Memorial Hospital in 1997. He has practiced at Mid-Michigan Ear, Nose, and Throat since July of 1997 and has been certified by the American Board of Otolaryngology since 1998. He has been a Clinical Instructor in the department of surgery at Michigan State University since 1998. He is a Fellow of the American College of Surgeons. He has privileges at Sparrow Hospital, Ingham Regional Medical Center, and Michigan Surgical Center. Dr. Lebeda performs all aspects of general Otolaryngology.